I got these plants today and completely forgot their names! I also do not know how to care for these pretties! The first is Purple Passion Plant, also known as Purple Velvet Plant. It has two scientific names, but one may have been eliminated by now ... Gynura sarmentosa, and Gyruna aurantiaca. The second one is commonly called a strawberry begonia, sometimes called a strawberry geranium. However, it is neither a begonia nor a geranium. It also has two scientific names ... Saxifraga stolonifera and Saxifraga sarmentosa. Please forgive me for not giving you care instructions right now. I have my right hand in a cast and a splint on my left wrist. I have to rest for a bit before typing more. I'll check later to see if you need further help. 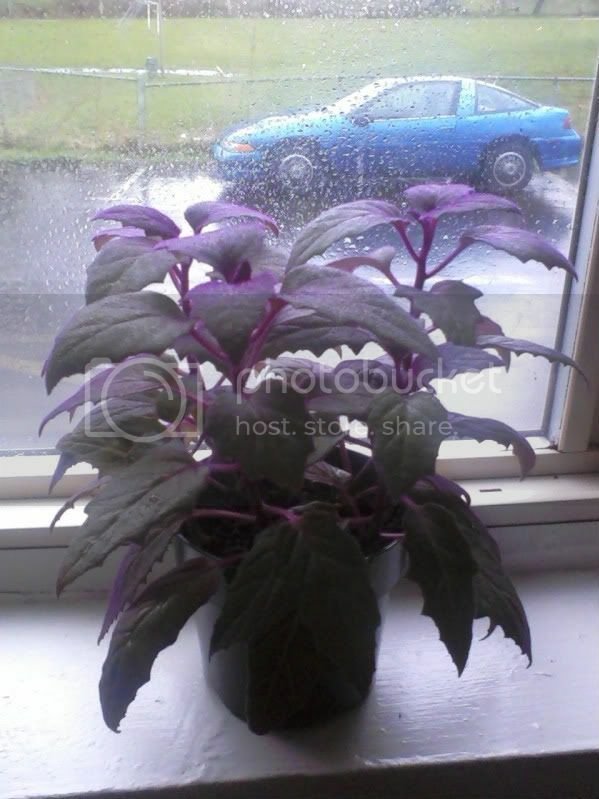 The Purple velvet plant likes light, so you can place it in front of a bright window. In insufficient light, the pretty purple color fades, and green predominates, so if you see that happening, just move it to a brighter spot. This is a plant that does not like water on its leaves, so do not mist it or get the leaves wet when you water the plant. Keep the soil evenly moist, but never wet, and do not allow the pot to stand in water that collects in the saucer. The best thing to do is water thoroughly, until water runs freely from the drainage holes in the bottom of the pot. Then wait until the surface of the soil feels dry to the touch. Dig your fingertip(s) into the soil surface to test for moisture. If it's dry to a depth of about 1/2 inch, it's time to water again. Remember that it's always better to err on the side of a bit too dry than too wet. If you're in doubt about whether the soil is dry enough, wait a day or two. Don't be anxious to move it to a larger pot. Purple Velvet prefers its roots snug in its container. This is a vining plant that does well in hanging containers, but to keep the appearance full and lush, you will need to prune it periodically. Do it before the plant begins to look unkempt. You can poke holes in the soil in pot the plant is in, insert the pieces you cut off, and they will very likely root and make your plant even fuller. If you prefer, you can use the prunings to start a whole new plant in a different pot. The Strawberry Begonia loves high humidity, but due to its hairy leaves, misting is not a good idea. You can raise the humidity around a plant by using humidity trays, or by grouping several plants together. 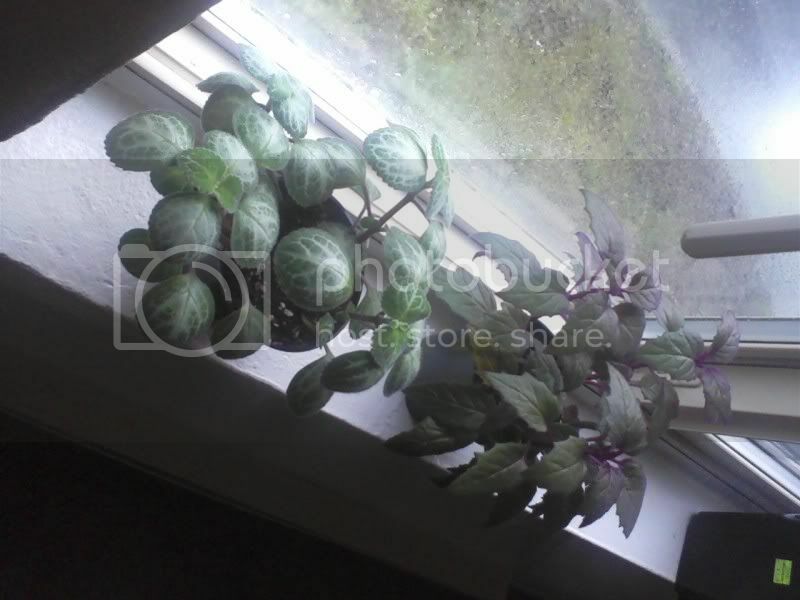 This plant will do best in bright, indirect light, so place it to the side or slightly back from a window. It is another plant that is best suited for a hanging container. It produces baby plantlets on the ends of long stems, which will drape over the edges of the pot. These plantlets can be potted up individually to make new plants. The soil should be kept evenly moist, never wet, so I suggest the same procedures as for the Purple Velvet Plant. Awesome! Thank you so much! They were so cute and my conscience just couldn't let me pass them by! Is it a good rule of thumb that any plant with fuzziness does not like being misted? Is it because they hold onto moisture for too long? Yes, the drops of moisture tend to be larger and stay on the leaf surface longer, increasing the possibility of disease. African violets are said not to like water on their leaves, either. I confess that I'm sometimes messy, though, so I just take a paper towel or tissue and gently blot up the water. The leaves on both of these plants are now wilted after such a short time period and I'm quite lost as to why. I did water them when I first got them a couple days ago because they were bone dry.The purple velvet gets morning and noon sun,while the strawberry begonia get's bright indirect light with my tassle fern. The only thing I can think of is that the lady whom I bought them from looked like she was relying completely on an overhanging grow light system,and then I take them home and give them natural light. Should I slowly increase it's exposure to natural light?Does this seem like a probable cause of wilting? Um ... you have sun in WA this time of year? I may consider a move northward! Did you give them a good, thorough watering, or just a little drizzle to moisten the surface of the soil? Give them a good drenching and see if they don't perk up for you. What exposure is the window you have them in? Is there by any chance a heat register below the window? While plants will react to differences in light intensity, wilting is not normally a symptom of such a change. Wilting is symptomatic of insufficient water, and that can result from different causes. In any case, it demonstrates that the plant's root are not able to absorb enough water to keep its cells filled and the cell walls rigid, to support the plant's tissues. One reason can be damage of some kind to the root system. A very common cause of such damage is root rot, which results from chronic overwatering. Another reason can be that the plant simply has not been given enough water for its needs. Since your plants are very new to you, I suspect it's the latter, rather than the former. I watered them until a little bit of water came out the bottom of the pots, but I have put the plants on a table away from the floor heater.I guess it's called a floor heater. It's this long horizontal metal strip-type appliance just an inch above the floor..It doesn't feel hot in that area when I stand next to it and the heaters are very wimpy. I'd say it's a good 70 degrees there, but we'll see if that was the culprit! If it's not should I water it again before the soil dries off? It's off and on sunny,but we have a huuuuuge window that faces the rising sun and a good amount of light hits that area for quite a long time. So even when we have clouds it's still fairly bright even though it's filtered. Give them a good drenching, especially if the soil seemed dry. Sometimes, if a plant gets dry and then is given water only until "a little" runs out the drainage holes, the water takes the path of least resistance, and just runs down through the space between the outside of the root ball and the sides of the container. The interior of the root ball is completely bypassed, and ... you guessed it ... the plant wilts. A good solution for this is to fill a container with water and set the potted plant in it. You want the water to come up the outside of the pot to a level just above the surface of the soil in the pot. (You might have to stand there and hold the pot, so it doesn't tip over in the water.) You don't want the water to run over the rim of the pot. Just let the pot sit there and soak up water, until the surface of the soil is completely wet. Then remove the pot and set it aside somewhere, such as in a sink, and let all the excess water drain out of the pot. After doing this once, you're usual method of watering should be sufficient. I recommend using warm water ... just out of the tap ... for this method of watering. That will help it moisten any soil that happens to contain a lot of peat. My plants are slowly,slowly perking back up. I drenched them better last night. What a relief! Thank you so much for the help!